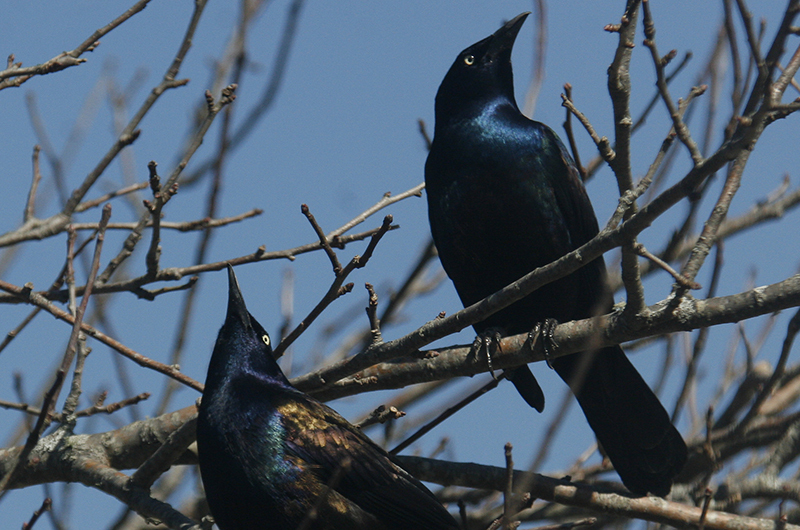 Large flocks of grackles are not necessarily welcome at feeders. Their iridescence is pretty but they exclude other species while they clean out all your seed. Fortunately, such large flocks are not common, generally occurring here on their northward and southward migrations. On occasion we get flocks that stay into the winter, but not through the winter. Albert Fischer still has a flock of a couple hundred grackles visiting his feeders every day. Linda Alley has also seen flocks of them recently, and Helen Green has had a few stragglers visiting her yard. They may or may not head farther south for the rest of the winter. Speaking of feeders, Wendy and I had a catbird visit our feeder on Feb. 3. It was the first one we have seen at our feeder this winter. 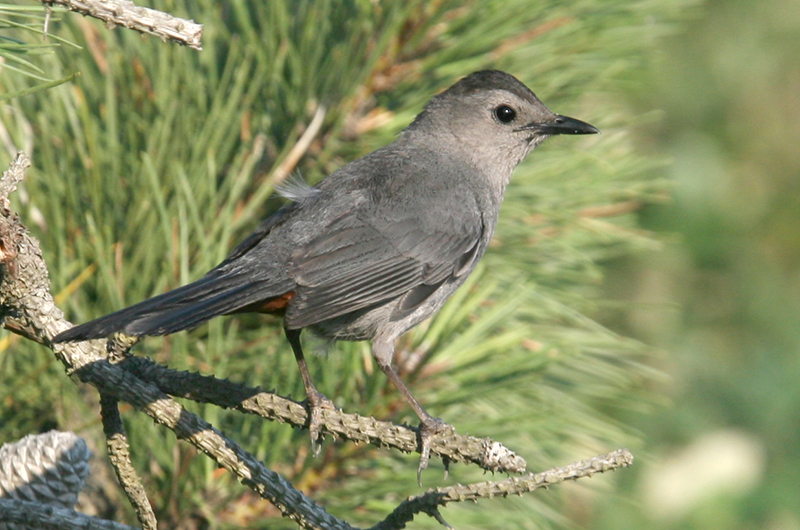 Catbirds will overwinter in small numbers in dense thickets. I visited the Oak Bluffs pumping station on the afternoon of Feb. 3. 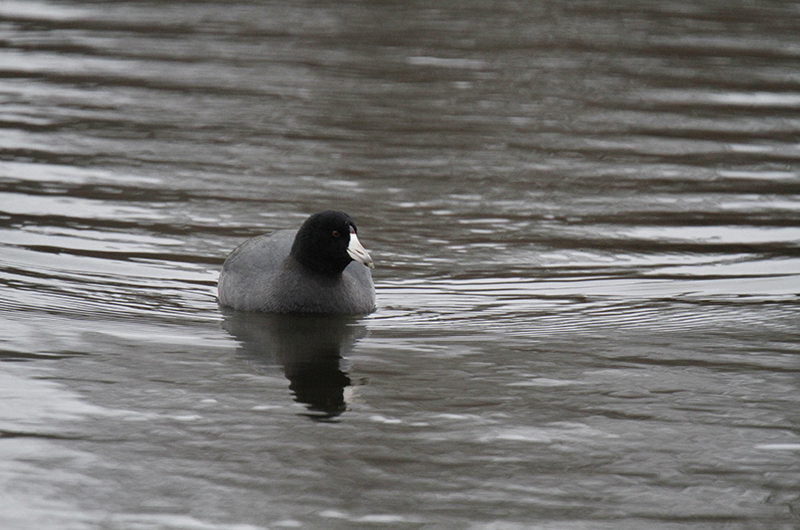 The only open water was near the station building, where an American coot was swimming along the shoreline. Also there were ring-necked ducks, American wigeon, hooded mergansers, bufflehead and mallard. Lanny McDowell spotted a dozen of the ring-necked ducks there the next day, and he also found the Barrow’s goldeneye that has been hanging out in Sengekontacket Pond. And Martha Moore has enjoyed seeing all three merganser species near her home on Tisbury Great Pond. 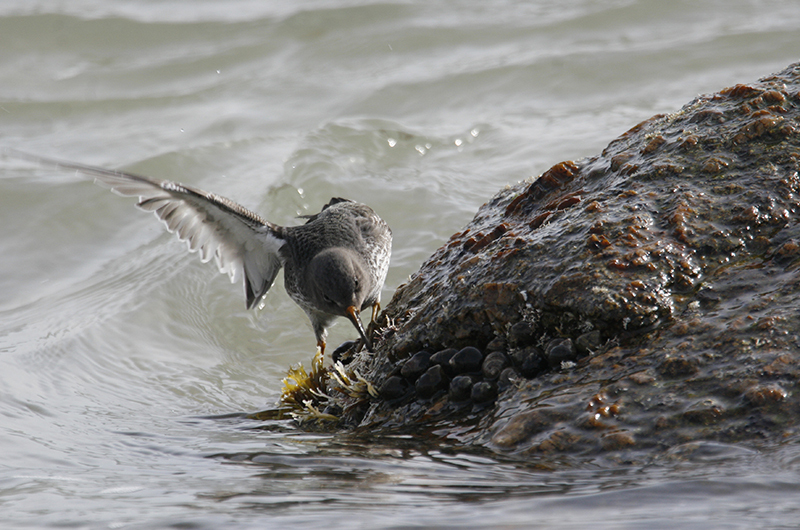 Bob Shriber spotted 10 purple sandpipers on the boulders at Philbin Beach on Jan. 28. On Feb. 2, a great horned owl was spotted along the Dr. Fisher Road in the state forest by Matthew Marra. Bald eagles are still around too. Mike Savoy spotted a juvenile bald eagle on the ice at Lake Tashmoo, near the Lake street dock, on Feb 2. Alex Friedman observed two of them on Oyster Pond same day. And on Feb. 4 Martha Moore observed an adult eagle catch a fish from Middle Point Cove of Tisbury Great Pond. It then flew to a nearby beach to consume the fish. Laurel Ludy and Everett Jones have also seen an eagle at nearby Thumb Point. The 59th annual Christmas Bird Count was held on Jan. 5 this year. There were 59 field participants, and another 21 individuals reported how many birds they spotted in their yards. As you may recall from previous columns, the weather was rather damp and dreary; definitely not the best conditions for finding birds. We found 112 species on count day plus one subspecies (Ipswich sparrow) and one hybrid black duck and mallard. We counted 16,520 individuals. The numbers of each species are reported below. This is well below our recent average of about 120 species. Birding three days before the count and three days after the count added four more species, identified in this list as CW (Count Week). Thank you Luanne Johnson for all your work as the compiler of these data. Brant (177), Canada goose (2419), mute swan (134), wood duck (1), gadwall (22), Eurasian wigeon (CW), American wigeon (74), American black duck (684), mallard (690), black duck/mallard hybrid (4), northern pintail (9), green-winged teal (36), ring-necked duck (2), greater scaup (315), lesser scaup (47), scaup species (43), common eider (1028), harlequin duck (44), surf scoter (250), white-winged scoter (186), black scoter (248), long-tailed duck (14), bufflehead (1,163), common goldeneye (337), hooded merganser (181), common merganser (2), red-breasted merganser (320), ruddy duck (4), wild turkey (297), red-throated loon (25), common loon (151), horned grebe (24), red-necked grebe (6), northern gannet (13), double-crested cormorant (6), great cormorant (133), great blue heron (31), black-crowned night heron (21), turkey vulture (8), northern harrier (9), sharp-shinned hawk (1), Cooper’s hawk (11), bald eagle (1), red-tailed hawk (17), black-bellied plover (CW), greater yellowlegs (2), sanderling (49), dunlin (18), purple sandpiper (10), thick-billed murre (4), razorbill (41), ring-billed gull (124), herring gull (757), great black-backed gull (118), rock pigeon (94), mourning dove (168), barn owl (3), eastern screech-owl (7), great horned owl (CW), snowy owl (2), Barred Owl (1), long-eared owl (2), northern saw-whet owl (1), belted kingfisher (17), red-headed woodpecker CW red-bellied woodpecker (77), yellow-bellied sapsucker (4), downy woodpecker (74), hairy woodpecker (16), northern flicker (50), merlin (2), eastern phoebe (1), blue jay (326), American crow (845), fish crow (17), common raven (3), horned lark (4), black-capped chickadee (1,134), tufted titmouse (234), red-breasted nuthatch (109), white-breasted nuthatch (123), brown creeper (5), marsh wren (2), Carolina wren (146), golden-crowned kinglet (27), ruby-crowned kinglet (11), eastern bluebird (77), hermit thrush (12), American robin (296), gray catbird (20), brown thrasher (1), northern mockingbird (21), European starling (635), cedar waxwing (3), snow bunting (43), orange-crowned warbler (2), palm warbler (2), pine warbler (15), yellow-rumped warbler (66), field sparrow (7), fox sparrow (2), dark-eyed junco (326), white-crowned sparrow (2), white-throated sparrow (146), savannah sparrow (22), Ipswich sparrow (2), song sparrow (272), swamp sparrow (10), Eastern towhee (21), northern cardinal (254), red-winged blackbird (6), Eastern meadowlark (1), rusty blackbird (2), common grackle (16), Baltimore oriole (2), house finch (148), purple finch (4), American goldfinch (81), house sparrow (187). It is getting light ever earlier and so this month our thoughts and ears turn to increased birdsong. Please report your sightings to birds@mvgazette.com. Robert Culbert will schedule a private Guided Birding Tour with you, and is an ecological consultant with Nature Watch, LLC living in Vineyard Haven.